ISLAMABAD: In a bid to avoid being listed in ‘grey area’ and to satisfy Financial Action Task Force (FATF) and other international organisations, Pakistan has revised and chalked out a new strategy. The new plan of action has not been made public yet but approved at the meeting of highest level National Security Committee in Islamabad on Friday. 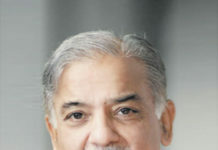 Under the new strategy, Pakistan has revised its already submitted plan to meet the demands and requirements of FATF but it is too early to say that the world organisation would accept it or will go ahead its hinted ‘embargo action’.‘The Nation’has already informed its readers about the FATF programme as a lead story in its previous edition. FATF has demanded Pakistan to take firm and concrete measures to end terrorism financing and support to terrorists and militants otherwise will have to face effective but punitive measures. Putting Pakistan on ‘Grey List’ is one of these measures. Pakistan will suffer a lot if FATF take action against it. According to informed sources, the civil and military leadership reaffirmed Pakistan’s commitment to work with the FATF and other international forums to curb the terrorism financing and militancy for achieving common goals and shared objectives. The meeting, chaired by caretaker Prime Minister Justice ® Nasiurl Mulk, was briefed on the FATF meeting to be held this month in Paris and the measures taken so far by the country to meet the international agency’s requirements. Early this year the FATF had raised certain objections and highlighted certain deficiencies in Pakistan’s anti-money laundering and anti-terror financing regimes and referred it to watch-list. 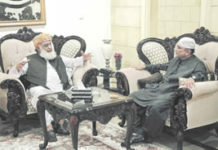 Furthermore, Pakistan was given 8th June as deadline to submit line of action but Pakistan crossed the deadline and it is not sure when the new plan would be submitted. The former Finance Minister Miftah Ismail had told the media that the new strategy would be submitted between 8th and 11th June. Islamabad was asked to provide certain information – relating to certain loopholes in its economic system – in the next meeting so the task force could decide if it should place the country on grey list or not. The civil-military huddle expressed satisfaction over the administrative and legal steps taken towards fulfilling the country’s international responsibilities under FATF framework. ISLAMABAD: Caretaker Prime Minister Justice (r) Nasir-ul-Mulk chairing meeting of National security Council. Pakistan would be placed on the FATF ‘grey list’ because of certain shortcomings identified by the watchdog. However, before Pakistan is put on the list an action plan has to be negotiated outlining the steps the country would be required to take. The action plan has been in the works for weeks now, but it is yet to be adopted. The NSC approved the presentation of the proposed plan to the FATF at its upcoming meeting. Earlier, Finance Minister Shamshad Akhtar gave a detailed presentation to the meeting about the upcoming Paris meeting and the steps taken so far by the country to meet FATF requirements. The government functionaries are confident that as they were fully cooperating with the FATF and meeting its requirements so the chances of Pakistan’s placement on ‘grey list’seemed minimal. Foreign Office Spokesman Dr Mohammad Faisal in a regular press briefing in the recent past said that an action plan to eradicate terrorist financing is being prepared and will accordingly be shared with the international body. Dr Faisal said that reports claiming that Pakistan will be transferred from the ‘grey list’ to the blacklist in June are not true as the FATF website clearly demarcates the countries in the blacklist as those which are noncooperative with the body. Caretaker Prime Minister Nasirul Mulk also shared with NSC members contents of his telephonic conversation with the US Vice President Mike Pence the other day. According to sources, Army Chief Gen Qamar Javed Bajwa briefed the meeting of his talks with US Secretary of State Mike Pompeo and said that the US is willing to cooperation with Islamabad but reiterated its old ‘mantra’ of to do more to eliminate, terrorism and militancy by taking off hands on terrorists and militants. The National Security Committee meeting also reviewed the overall security situation in the country, election arrangements and expressed the resolve to maintain order and peace in the country which is vital for holding the upcoming elections in free, fair and transparent fashion. The 25th meeting of the NSC was also attended by Abdullah Hussain Haroon, Minister for Defence/Foreign Affairs, Shamshad Akhtar, Minister for Finance, Muhammad Azam Khan, Minister for Interior, Syed Ali Zafar, Minister for Law/Information, Chairman Joint Chiefs of Staff Committee General Zubair Mahmood Hayat, Chief of Army Staff General Qamar Javed Bajwa, Chief of Naval Staff Admiral Zafar Mahmood Abbasi, Chief of Air Staff Air Chief Marshal Mujahid Anwar Khan, National Security Advisor Lt. Gen (r) Nasser Khan Janjua, Director General ISI Lt. Gen Naveed Mukhtar and senior civil and military officials.